Also available in audio version, Children Come First CD. 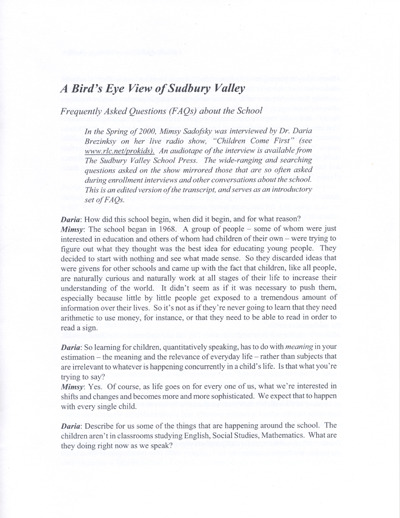 In the Spring of 2000, Mimsy Sadofsky was interviewed by Dr. Daria Brezinsky on her live radio show, “Children Come First”. The wide-ranging and searching questions asked on the show mirrored those that are so often asked during enrollment interviews and other conversations about the school. Q “What types of things do the children learn at Sudbury School?" A “Well, I think they learn every type of thing but there are some things that I think every kid has to learn here because you can’t be here and not learn them. One of those things is to love the outdoors. Kids can spend as much time outside as they want here and that’s very healthy for their minds, their hearts, their souls, their bodies. There’s not a kid who’s gone to school here who doesn’t afterwards talk about how important the outdoors was to them. “I also think the whole idea of the governance of the school means that they have to constantly examine ethical issues and that’s another thing I think kids who go to school here cannot possibly avoid learning.